I’ve had this Jacob dress for a while now, but had experienced a bit of trouble accessorizing it in a way that felt fresh to me. While I love gold jewelry, pairing it with the tawny hue seemed slightly predictable and a little played out (at least on my part!). Coming across a clearance priced necklace the other day was what finally inspired an outfit: the white and silver felt clean and crisp, and I knew they would make for perfect summertime accents. It also gave me a reason to also wear these flats again to create an unabashedly coordinated look. Gorgeous! Love those hits of silver! super cute chain necklace! you look so chic! You proved that the statement ‘tall girls can carry anything’ You are petite and still rock every single style.. but this classic suits you best! Drop by see my blog sometime! Beautiful look! I do like silver with this. I’d normally reach for gold too, but this is much more fresh. Beautiful outfit!!! Really really gorgeous. I love that dress. Your eye make-up is flawless in this post! The silver and white really is such a crisp pairing. love the look. the accessories are really impressive. I love the way you’ve styled this – that jacket is perfect for pairing with that striped dress. The silver is unexpected, but it works so well. Love this look! 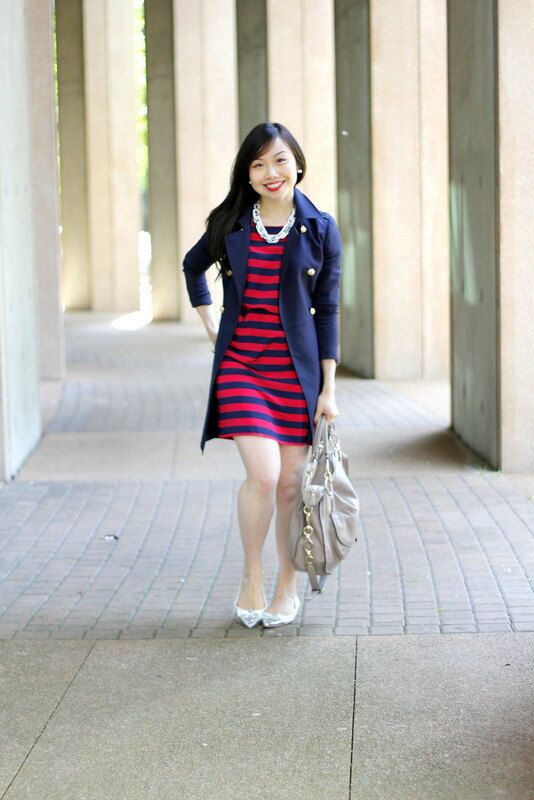 Cute nautical-inspired look! Love the necklace. I love that you went against the grain and did silver accents with this nautical dress. The shoes are adorable too! I love the chic simplicity of it all. So chic, Jen! The white and silver tones really do bring a fresh and bright spin to your striped dress. Your make-up looks fabulous too! Jen! Chic has got to be your middle name. 🙂 I have striped dresses like this, but I never style it as gorgeous as you do. I normally just throw on a chambray shirt and some bright colored flats. LOL. I’m so envious of your flats. They are beautiful! You wouldn’t happen to be a size 8, would you? hahaha. Well, I hope you’ve been well and here’s to an amazing week! I love this look!! So classic! You definitely succeeded in accessorizing that dress! the navy look is always a hit… you look great! Beautiful as always. Love the shoes! That is such a beautiful trench coat! I’ve been thinking about getting a classic tan trench recently, but I’m quite inspired by your navy one! forever chic you are my dear! I lovvve this dress (I almost bought it too, but it just didn’t fit me right! So sad!) and I love it paired with the navy trench! Such a gorgeous, classic combo! I’ve been wanting to expand my silver jewelry collection as well – I LOVE gold, but there are days where it either doesn’t work, or, like you say, just seems to predictable! Love the direction you took here! xo!